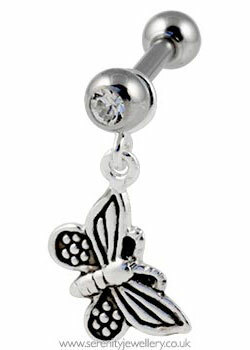 8mm sterling silver hanging butterfly on a 6mm or 8mm barbell with 3mm screw-on clear crystal jewelled ball closure on the front and plain screw-on ball on the back. Love this it is just the right size great service and delivery will defo be buying again. Bought this earring for a stocking filler for my daughter. She loved it and has asked for details of the website so she can purchase further cartilage earrings. Thank you.